Mercuric Chloride Poisoning is the accidental or intentional intake of compounds containing the chemical. What is Mercuric Chloride Poisoning? What are the Causes of Mercuric Chloride Poisoning? What are the Signs and Symptoms of Mercuric Chloride Poisoning? The signs and symptoms of Mercuric Chloride Poisoning can vary from one individual to another. It may be mild in some and severe in others. Several systems of the body may be affected. The poisoning may occur due to swallowing of the compound. How is First Aid administered for Mercuric Chloride Poisoning? Who should administer First Aid for Mercuric Chloride Poisoning? 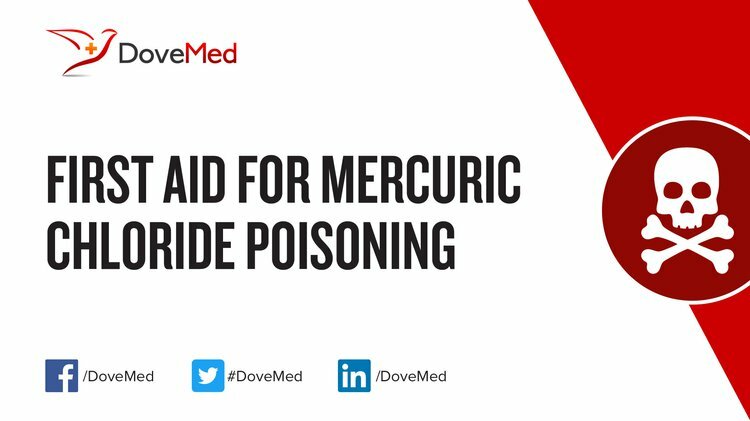 First aid for Mercuric Chloride Poisoning is administered by healthcare professionals. What is the Prognosis of Mercuric Chloride Poisoning? How can Mercuric Chloride Poisoning be Prevented? Xu, F., Farkas, S., Kortbeek, S., Zhang, F. X., Chen, L., Zamponi, G. W., & Syed, N. I. (2012). Mercury-induced toxicity of rat cortical neurons is mediated through N-methyl-D-Aspartate receptors. Molecular brain, 5(1), 30. Heath, J. C., Abdelmageed, Y., Braden, T. D., & Goyal, H. O. (2012). The effects of chronic ingestion of mercuric chloride on fertility and testosterone levels in male Sprague Dawley rats. BioMed Research International, 2012. Mohamed, E. T., Mahran, H. A., & Mahmoud, M. S. (2010). Hepato ameliorative effect of Azadirachtaindica Leaves extract against mercuric chloride environmental pollution. Journal of American science, 6(9), 735-51. Lal Shah, S. (2010). Hematological changes in Tinca tinca after exposure to lethal and sublethal doses of Mercury, Cadmium and Lead. Iranian Journal of Fisheries Sciences, 9(3), 434-443. Olson, K. R. (2010). Activated charcoal for acute poisoning: one toxicologist’s journey. Journal of medical toxicology, 6(2), 190-198. Kessler, R. (2013). The Minamata Convention on Mercury: a first step toward protecting future generations. Environmental health perspectives, 121(10), A304. Hu, Y., Li, J., Ma, L., Peng, Q., Feng, W., Zhang, L., ... & Li, L. (2010). High efficiency transport of quantum dots into plant roots with the aid of silwet L-77. Plant Physiology and Biochemistry, 48(8), 703-709. Nwokocha, C., Ejebe, D., Nwangwa, E., Ekene, N., Akonoghrere, R., & Ukwu, J. (2010). The effects of bitter kola supplemented diet on hepatotoxicity of mercury in Wistar rats. Journal of Applied Sciences and Environmental Management, 14(1).